Rotational profiles vary widely among healthy children., Rotation of the long bones refers to the twist of the bone about its long axis. Rotational deformity of the lower limb in the transverse plane is associated with many clinical settings ranging from harmless to excessive intoeing in children, latter affecting the activities of daily living. Rotational problems of the lower limb in the transverse plane have been ignored often because of the difficulty in their assessment. These difficulties have led to varied opinions and controversy regarding the evaluation and management of rotational problems. For routine clinical evaluation, physical examination remains the primary method of assessment. “Intoeing” is the most common complaint faced by pediatric orthopedic surgeons that mainly have physiological origin. Making an accurate diagnosis along with a proper concept of its natural development comprises the mainstay of treatment. It is essential that all clinicians who treat children are able to confidently differentiate children with pathological conditions from those with normal variants. Various factors are responsible for “intoeing” in different age groups. Age is another important variable because version, soft-tissue pliability, and muscle coordination change as the child matures.,,,,,, In most cases, intoeing is entirely a benign condition and is a feature of normal variation of growth pattern. Lack of any symptoms such as pain, symmetrical deformities, absence of any stiffness in the affected joints, and no associated systemic disorders or syndromes indicate a benign outcome with excellent long-term outcome. Most children with these symptoms spontaneously stop intoeing before the age of 9 years. No treatment is, therefore, required in the majority of cases. To document the natural history of these torsions with follow-up in our study. This study was conducted at the Department of Orthopedics, Indraprastha Apollo Hospital, New Delhi. Children presenting to the outpatient department during the period of April to September 2013 were followed up. The study design was prospective with 14 months of study period on a sample size of 27. All children who had suffered any metabolic disorder in the last 6 months. A total of 27 children (54 lower limbs) were included and followed up. Parents/guardians of children included were informed about the study and requested to attend the follow-up clinic. A pretyped detailed consent form in the language understandable by the family members was signed by the parent/guardian of each child. A detailed history of basic demographic data and medical history was taken from the parents/guardians of each child, and only significant details were recorded. 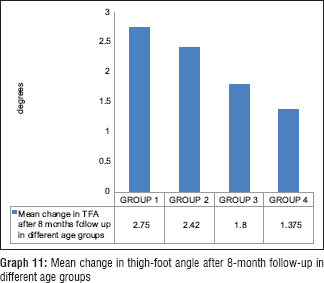 A thorough clinical assessment was done where thigh transmalleolar axis angle (TTA), clinical assessment of femoral anteversion (FA), foot progression angle (FPA), thigh-foot angle (TFA) and hip rotations were assessed [Figure 1], [Figure 2], [Figure 3], [Figure 4], [Figure 5], [Figure 6], [Figure 7], [Figure 8]. In the laboratory assessment, serum calcium, serum phosphorus, serum alkaline phosphatase, and serum Vitamin D3 were sent in all the patients at their 1st visit to rule out any active metabolic disease. Statistical analysis was performed by the SPSS program for Windows, version 17.0 (Chicago, Illinois, USA). Continuous variables are presented as mean ±SD, and categorical variables are presented as absolute numbers and percentage. Normally distributed continuous variables were compared using ANOVA. Multiple comparison tests were used to assess the differences between the individual groups using bonferroni correction. Categorical variables were analyzed using the chi square test. Spearman's Correlation was also used among various variables. For all statistical tests, a P < 0.05 was taken to indicate a significant difference. 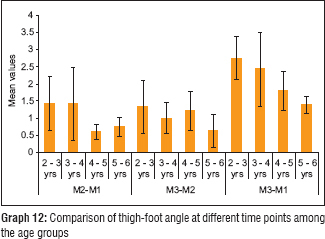 In our study of 27 children presenting with intoeing gait and followed up for 8 months, the mean TTA in different age groups at the 1st visit, 1st follow-up, and 2nd follow-up is shown in [Graph 1]. 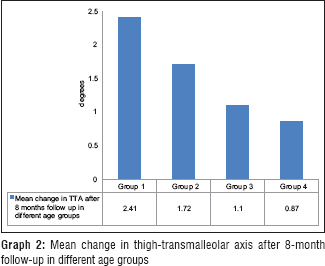 Mean change in TTA after 8-month follow-up in different age groups was 2.41° in Group 1, 1.72° in Group 2, 1.1° in Group 3, and 0.87° in Group 4 [Graph 2]. 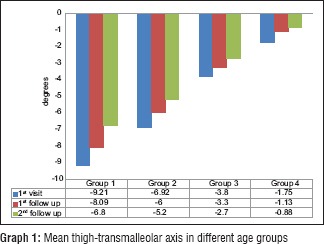 [Graph 3] shows the change in TTA among the various age groups, and it was observed that there was a significant difference in the mean change in TTA values during the follow-up among the various age groups (P < 0.001). 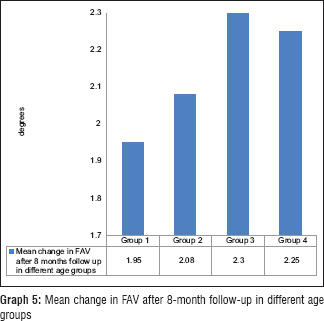 Mean FA at the 1st visit, 1st follow-up, and 2nd follow-up in different age groups is shown in [Graph 4]. Mean change in FA after 8-month follow-up in different age groups was 1.95°, 2.08°, 2.3°, and 2.25° in age Groups 1, 2, 3, and 4, respectively [Graph 5]. 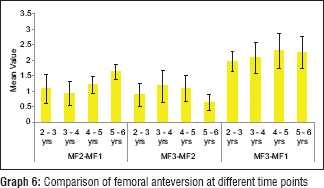 [Graph 6] shows the change in femoral anteversion (FAV) among the various age groups. It was observed that after 8-month follow-up, age Group 3 has the highest mean change at 2.3 while age Group 1 had the lowest mean change at 1.958. Further, age Group 4 has the mean change of 2.25, and for Group 2, mean change was 2.083. It was also observed that there was no significant difference in the mean change in FAV during the follow-up among the various age groups (P = 0.453). 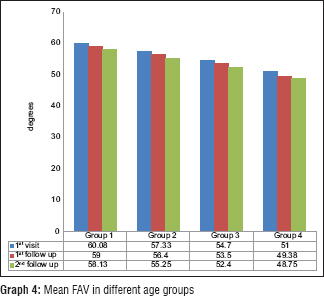 Mean FPA at the 1st visit, 1st follow-up, and 2nd follow-up in different age groups is shown in [Graph 7]. 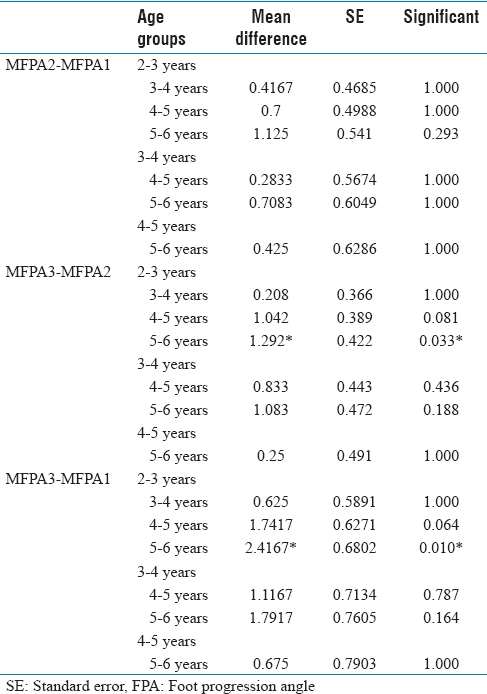 Mean change in FPA after 8-month follow-up in different age groups was 5.54°, 4.91°, 3.8°, and 3.12° in age Groups 1, 2, 3, and 4, respectively [Graph 8]. 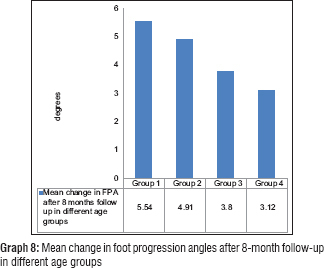 [Graph 9] shows the change in FPA among the various age groups after 8-month follow-up. It was observed that age Group 1 has the highest mean change of 5.542 while age Group 4 had the lowest mean change of 3.125. Further, age Group 2 has the mean change of 4.917, and for age Group 3, mean change was 3.8. It was also observed that there was a significant difference in the mean change in FPA during the follow-up among the various age groups (P = 0.006). A significant difference in the mean change in FPA was also observed after the 1st follow-up (P = 0.012). Mean TFAs at the 1st visit, 1st follow-up, and 2nd follow-up in different age groups are shown in [Graph 10]. Mean change in TFAs after 8-month follow-up in different age groups was 2.75° in Group 1, 2.42° in Group 2, 1.8° in Group 3, and 1.37° in Group 4 [Graph 11]. [Graph 12] shows the change in TFAs among the various age groups. It was observed that under the M3-M1 TFA, age Group 1 has the highest mean change angle at 2.75 while age Group 4 has the lowest mean change angle at 1.38. Further, age Group 2 has the mean change angle of 2.42, and for age Group 3, mean change angle was 1.8. It was also observed that there was a significant difference in the mean change in thigh-foot values during the follow-up among the various age groups (P = 0.010). 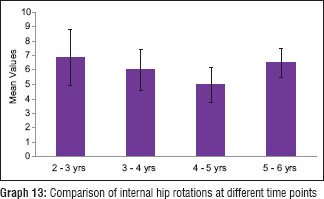 [Graph 13] shows the comparison of internal rotation (IR) after 8-month follow-up among the various age groups. It was observed that the mean change in IR is highest in age Group 1 at 6.88 while it was lowest in age Group 3 at 5.0. Further, age Group 2 had the mean change of 6.0, and for age Group 4, mean change was 6.5. It was also observed that there was no significant difference in the mean change in IR during the follow-up among the various age groups (P = 0.204). 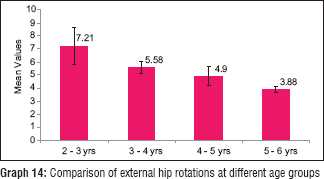 [Graph 14] shows the comparison of external rotation (ER) after 8-month follow-up among the various age groups. It was observed that the mean change was highest in age Group 1 at 7.21 while it was lowest in age Group 4 at 3.88. Further, age Group 2 had the mean change of 5.58, and for age Group 3, mean change was 4.9. It was also observed that there was a significant difference in the mean change in ER (P < 0.001). Younger the child, the more difficult was it to measure accurately. It took a lot of patience and perseverance not only by us but also on the part of family to get the child to cooperate sufficiently during measurements. All these 27 families were very compliant during the course of our study period. Modalities such as computed tomography (CT) scans and other forms of imaging were deliberately avoided both due to the radiation it imparted and their excessive cost. All measurements were clinically obtained in the best possible way and compiled.,,, Statistical correlations were studied using statistical analysis performed by the SPSS program for Windows, version 17.0. Continuous variables are presented as mean ± standard deviation, and categorical variables are presented as absolute numbers and percentage. Normally distributed continuous variables were compared using analysis of variance. Multiple comparison tests were used to assess the differences between the individual groups using Bonferroni correction. Categorical variables were analyzed using the Chi-square test. Spearman's correlation was also used among various variables. For all statistical tests, P < 0.05 was taken to indicate a significant difference. Tibial torsion is defined as the relationship between the axis of rotation of the knee and the transmalleolar axis. More complex and expensive methods of measurements which may be accurate probably have been described involving the use of CT scans, ultrasonography, fluoroscopy, and clinical measurement aids. However, their advantages over simpler clinical measurements remain to be demonstrated. Thus, we in our endeavor to measure tibial torsion in our study population resorted to simpler clinical methods. Two methods were used to measure internal tibial torsion (ITT), namely TTA and TFA., We felt that TTA measurement was relatively more accurate than that of TFA. This was because in the former, we had malleoli as the bony anatomical markers to increase the authenticity of our measurements. Hence, we used TTA in all our statistical correlation and inferences. 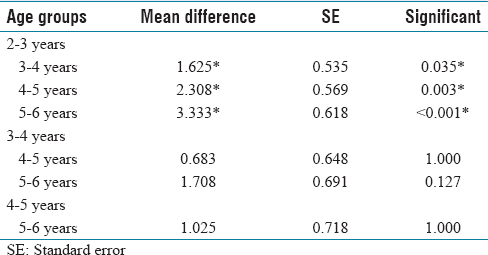 However, we found a significant positive correlation with values of TTA with TFA in our study [Table 2]. Statistical analysis showed that the change in TTA over 8 months in age Group 1 has the highest mean change angle of 2.42° followed by Group 2, Group 3, and Group 4 with values 1.75°, 1.11°, and 2.42°, respectively. 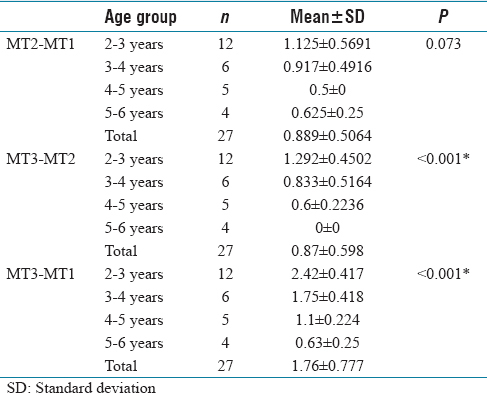 The progressive decreasing value of change in TTA over 8 months in these age groups as the child becomes older was found to be significant (P < 0.001) in our study [Table 3]. 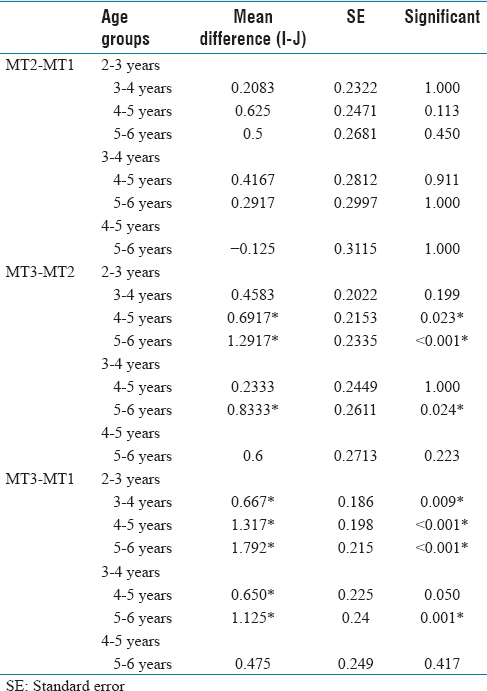 Further post hoc analysis during the follow-up of patients for 8 months, it was observed that there was a significant mean difference in change in TTA between 1st age group and rest of the other three age groups (P = 0.009, <0.001, <0.001), respectively [Table 4]. We also tried correlating TFA measurements with various age groups and found that change in TFA after 8-month follow-up in the age Group 1 has the highest value of 2.75° while the age Group 4 has the lowest mean change angle of 1.38°. 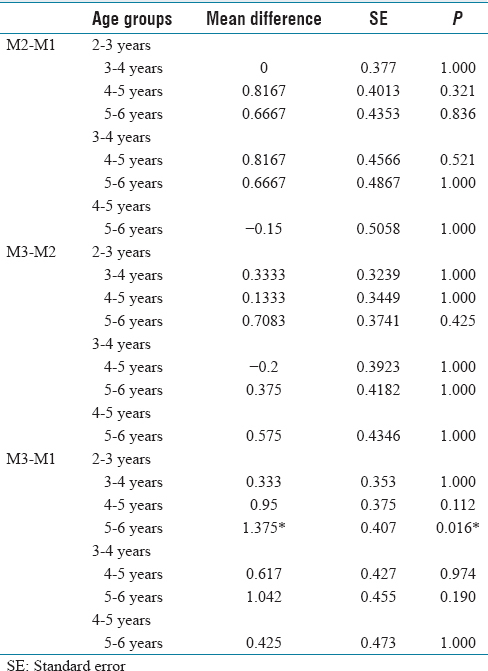 This change in value of TFA over 8 months in various age groups was found to be significant (P = 0.010) [Table 5]. 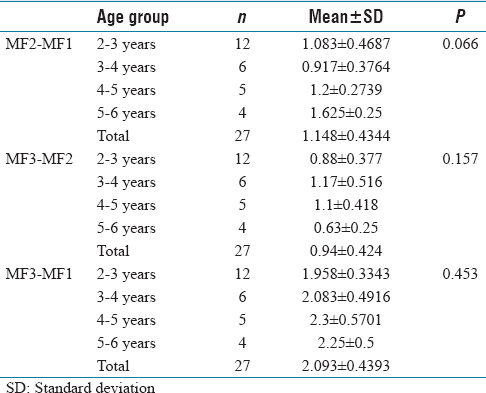 Further post hoc analysis during the follow-up of patients over 8 months showed a significant mean difference in change of TFA of 1.375 between 2–3 years and 5–6 years of age groups (P = 0.016) [Table 6]. FA is the inclination of the axis of the femoral neck with reference to the knee axis projected on a plane perpendicular to the shaft axis., The clinical means for the measurement of clinical anteversion include the assessment of hip rotations., and prone rotation test for FA., It is believed that for routine management of children with rotational problems, physical examination alone is sufficient and appropriate., On the average, FA ranges from 30 to 40° at birth, and decreases progressively throughout growth. In adults, anteversion averages between 8° and 14°, with an average of 8° in men and 14° in women., Intoeing secondary to excessive FA was most pronounced between the ages of 4 and 6 years and improving later. A correlation has been recognized between hip rotations and clinical FA. A difference in IR and ER on the extended hip was thought to be good technique for assessing FA; however, this test is more significant beyond 3 years of age because IR is limited by factors extrinsic to hip joint (more of ER). In our study population, we found an arc shift from more negative IR toward more positive ER. We also realized that arc can be deceptive in children with excessive ligamentous laxity where one observes an increase of not only IR but also ER. The amount of internal and ER of hip formed a total arc of about 90° with changes in the hip rotations shifting the arc relatively on one side. IR of 80–90° with minimal or no ER suggests severe excessive FA. 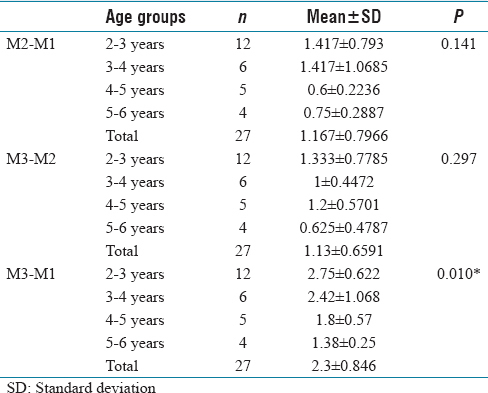 In the analysis of clinical FA values and its comparison with various age groups, it was found that progressive change as the child grew older was not significant (P = 0.453) [Table 7]. The same was the case when we correlated the change in IR values with various age groups after 8-month follow-up (P = 0.204) [Table 8]. However, a significant correlation was observed between the values of ER with various age groups over a period of 8 months (P < 0.01) [Table 9]. Svenningsen et al. in 1989 observed a better correlation of ER as against IR with FA and hence advised caution while assessing the degree of FA clinically through hip rotations. ER seemed to be better predictive factor than IR. Further post hoc analysis changes in ER with various age groups revealed a significant correlation of the values in Group 1 to same with all the other groups [Table 10]. FPA is the angular difference between the long axis of foot and line of progression. FPA is normally +10° with a range from −3 to +20° (minus sign denotes intoeing and plus sign denotes outtoeing). 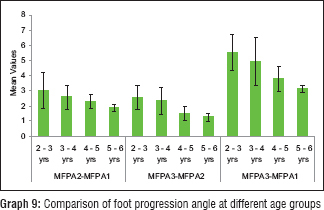 FPA has been proven to be a simple and objective parameter to monitor a change in child's gait with age. FPA footprints provide a permanent record of objective data and reproducible measurements that proved to be a valuable tool in addition to the clinical examinations. In our study, FPA was accumulative effect of both tibial torsion and FA; hence, we included this parameter in our correlation and tried to determine any correlation between TTA and clinical anteversion individually with FPA [Table 11]. The correlation between values of TTA with that of FPA found to be significant in our study (P = 0.001) [Table 11]. We also correlated the values of change of FPA with various age groups and found that there was a significant correlation between them both after the 1st and 2nd follow-up (P = 0.012 and 0.006, respectively) [Table 12]. 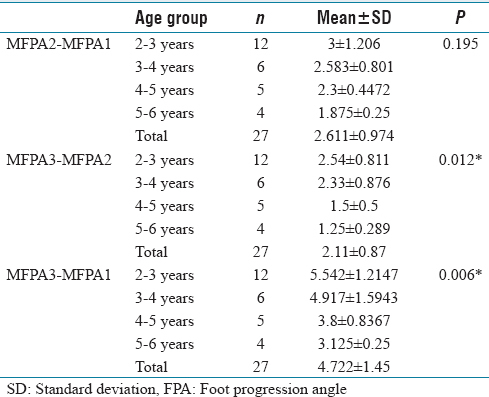 Further post hoc analysis after 8-month follow-up showed that there was a significant mean difference in change in FPA between age Group 1 and age Group 4 (P = 0.010) [Table 13]. We do realize that our study population was small with a short follow-up of 8 months, and hence, there were constraints to form firm conclusions in our study. The patient distribution in various age groups even though small in number showed relatively more children in Group 1 and least number of children in Group 4. The younger the child was, the more the family was concerned with intoeing of their child. We were comfortable using simple yet significant clinical measurements to assess and analyze our study. Statistical correlations are enumerated [Table 2], [Table 3], [Table 4], [Table 5], [Table 6], [Table 7], [Table 8], [Table 9], [Table 10], [Table 11], [Table 12], [Table 13], [Table 14]. The decrease of FA with age correlated better with increase of hip ER. FPA was a significant clinical parameter which gave us an objective picture of the change in both femoral and tibial torsions with age. In our study, there was a definite and significant decrease in FPA and ITT with increasing age. The values of clinical anteversion also decreased with age along with a gradual decrease of IR and an increase of ER. Engel GM, Staheli LT. The natural history of torsion and other factors influencing gait in childhood. Clin Orthop Relat Res 1974;99:12-7. 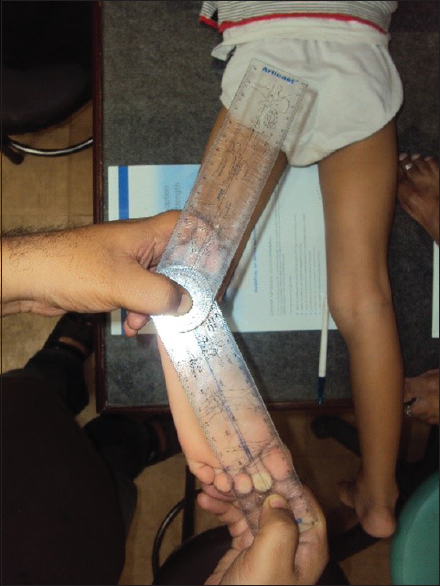 Staheli LT, Corbett M, Wyss C, King H. Lower-extremity rotational problems in children. Normal values to guide management. J Bone Joint Surg Am 1985;67:39-47. Fabry G, Cheng LX, Molenaers G. Normal and abnormal torsional development in children. Clin Orthop Relat Res 1994;302:22-6. Lincon TL, Suen PW. Common rotational variations in children. J Am Acad Orthop Surg 2003;11:312-20. Staheli LT. Rotational problems in children. Instr Course Lect 1994;43:199-209. Kling TF Jr, Hensinger RN. Angular and torsional deformities of the lower limbs in chidren. Clin Orthop Relat Res 1983;176:136-47. Sutherland DH, Olshen R, Cooper L, Woo SL. The development of mature gait. J Bone Joint Surg Am 1980;62:336-53. Walker JM. Comparison of normal and abnormal human fetal hip joints: a quantitative study with significance to congenital hip disease. J Pediatr Orthop 1983;3:173-83. Watanabe RS. Embryology of the human hip. Clin Orthop Relat Res 1974;98:8-26. Hensinger RN. Rotational problems of the lower extremity. Postgrad Med 1976;60:161-7. Weseley MS, Barenfeld PA, Eisenstein AL. Thoughts on in-toeing and out-toeing: twenty years' experience with over 5000 cases and a review of the literature. Foot Ankle 1981;2:49-57. Staheli LT. In-toeing and out-toeing in children. J Fam Pract 1983;16:1005-11. Pasciak M, Stoll TM, Hefti F. Relation of femoral to tibial torsion in children measured by ultrasound. J Pediatr Orthop B. 1996;5:268-72. Bruce RW Jr. Torsional and angular deformities. Pediatr Clin North Am 1996;43:867-81. Matovinovic D, Nemec B, Gulan G, Sestan B, Ravlic-Gulan J. 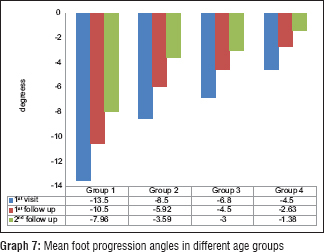 Comparison in regression of femoral neck anteversion in children with normal, intoeing and outtoeing gait-prospective study. Coll Antropol 1998;22:525-32. Davids JR, Davis RB, Jameson LC, Westberry DE, Hardin JW. Surgical management of persistent intoeing gait due to increased internal tibial torsion in children. J Pediatr Orthop 2014;34:467-73. Li YH, Leong JC. Intoeing gait in children. Hong Kong Med J 1999;5:360-6. Staheli LT. Medial femoral torsion. Orthop Clin North Am 1980;11:39-50. Gulan G, Matavinovic D, Nemec B, Rubinic D, Ravlic-Gulan J. Femoral neck anteversion: Values, development, measurement, common problems. Coll Antropol 2000;24:521-7. Crane L. Femoral torsion and its relation to toeing-in and toeing-out. J Bone Joint Surg Am 1959;41-A: 421-8. Ruwe PA, Gage JR, Ozonoff MB, DeLuca PA. Clinical determination of femoral anteversion. A comparison with established techniques. J Bone Joint Surg Am 1992;74:820-30. Shands AR Jr, Steele MK. Torsion of the femur; a follow-up report on the use of the Dunlap method for its determination. J Bone Joint Surg Am 1958;40-A: 803-16. Fabry G, MacEwen GD, Shands AR Jr. Torsion of the femur. A follow-up study in normal and abnormal conditions. J Bone Joint Surg Am 1973;55:1726-38. Kate BR. Anteversion versus torsion of the femoral neck. Acta Anat (Basel) 1976;94:457-63. Gelberman RH, Cohen MS, Desai SS, Griffin PP, Salamon PB, O'Brien TM. Femoral anteversion. 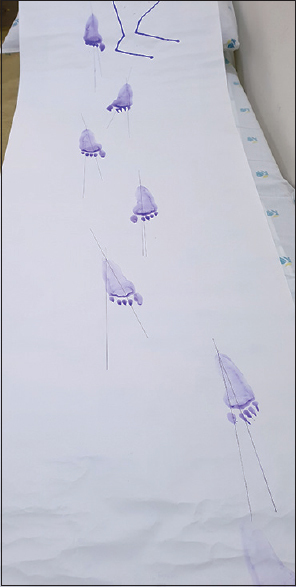 A clinical assessment of idiopathic intoeing gait in children. J Bone Joint Surg Br 1987;69:75-9. Svenningsen S, Apalset K, Terjesen T. Regression of femoral anteversion. A prospective study of intoeing children. Acta Orthop Scand 1989;60:170-3. Losel S, Burgess-Million MJ, Micheli LJ, Edington CJ. 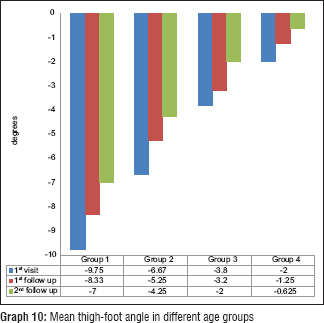 A simplified technique for determining foot progression angle in children 4 to 16 years of age. J Pediatr Orthop 1996;16:570-4.